Hackensack voted, but did the winning team tell us to "keep the change?" On May 14, 2013 the residents of Hackensack overwhelmingly voted for "change." Some of that "change" was expected to come through open government and an end to back room deals rewarding insiders. But is that what we are getting? At their reorganization meeting on July 1, 2013, the council hired Frank Catania, Jr. as the Municipal Prosecutor. As The Record noted in their July 4, 2013 article Catania is a longtime friend and business partner of CFC insider Anthony Rottino. 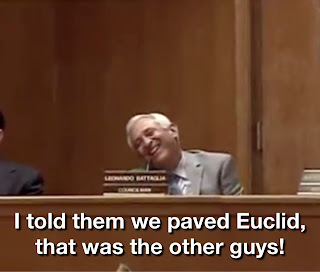 At their August 20, 2013 meeting, the new council hired Richard Takvorian to serve as the temporary Assistant Municipal Judge. The Scoop has previously noted that the Takvorian family, allies of the CFC team, had donated in total $3,600 to their 2013 campaign. Resolution 330-13 authorizing the hire of Richard Takvorian indicates that the City Clerk will maintain a copy of his contract for public inspection. Though I requested the contract governing Mr. Takvorian's employment on three separate occasions, I have been advised by City Clerk Debra Heck that no such contract exists and that Mr. Takvorian was "hired by resolution." Resolution 330-13 does not indicate how Takvorian will be compensated or outline his duties. I ask you the reader, is this open and transparent government? According to the CFC platform, they pledged to create a "Redevelopment Commission" to oversee development and negotiate with prospective developers. This commission was to include elected officials, residents, and development experts. In an abrupt change of direction, the team decided to hire a single individual to serve as the Director of Economic Development. It is no secret that Hackensack is in dire need of economic redevelopment, Main Street is a stretch of vacant store fronts and businesses that are barely surviving. How many more barber shops, nail salons, and dollar stores can Hackensack accommodate? With a revamping of planning and zoning having just been completed, and a redevelopment of downtown potentially in sight, a Director of Economic Development can prove to be the hire with the greatest long term implications for the City of Hackensack. As such, the council should search far and wide to find the most able and qualified candidate, but is that what they have done? On September 13, the city posted an advertisement for the position of Chief Financial Officer--this listing will run for longer than one month before resumes must be submitted. On July 8, the city posted a request for qualifications seeking various professional services--this listing ran for ten days before submissions were due. The advertisement for the position of Director of Economic Development, a position with the potential for serious long term implications for the City of Hackensack, a position to be filled by an individual who can potentially write the legacy of this council, was listed for only five days. I can only wonder why with a redevelopment plan decades in the making this position so urgently needed to be filled? I would question if the short notice of the position was perhaps in an effort to intentionally maintain a small applicant pool in favor of a chosen candidate--a CFC insider. Unfortunately, an identification of the potential applicant pool could not be done as several OPRA requests for a list of applicants, a copy of applications, and a copy of cover letters of interest have been denied by the City of Hackensack. City Manager Steve LoIacono and City Clerk Debra Heck have both asserted that by advice of counsel applicant information is not subject to OPRA. However, both New Jersey statutes and Executive Orders dictate that the resumes of unsuccessful candidates will be released with the consent of the candidate and the release of applications, cover letters of interest, and applicant identities are not specified as protected items under the provisions of OPRA. Will this be the subject of a second round of litigation with the city over an unjust denial of an OPRA request? I have also requested a copy of Mr. Rottino's employment contract with the city. I have been advised that no contract exists (yet Mr. LoIacono has indicated that Rottino will be paid $130,000 annually). For a position that needed to be so urgently filled, here we are a month after hiring a CFC insider and we are without an employment contract. At their August 20, 2013 meeting, the new council hired Write Associates to serve as the city's public relations consultant. Write Associates served as the campaign strategist for the CFC team. Several residents have spoken out regarding this hiring citing potential conflicts of interest. The team has in essence hired their personal cheer leader to represent the city's best interests. Council Candidate Victor Sasson noted that this hire should represent the interests of the entire city. Other residents have noted objections stemming from not just the potential conflicting political interests of the council and interests of the city, but the professionalism of Write Associates' Thom Ammirato. Resident Regina DiPasqua spoke at a council meeting with regard to certain unprofessional communications received from Thom Ammirato. Regina DiPasqua remarked to The Scoop that in her exchange with Ammirato he was "brash, harsh, and rude," she went on to remark that hopefully "he will not be so judgmental and harsh in his future dealings with the public." The Scoop has previously noted similar findings. During campaign season, The Scoop noted that the campaign's public relations consultant alienated and talked down to voters calling some "delusional" and "uninformed." In a most recent exchange with Ammirato, he has informed The Scoop "I do not send press releases to bloggers." I would think that a council that ran on a platform of honest, open, and inclusive government would want information disseminated to residents in any manner possible. Resolution 364-13 authorizing the hire of Write Associates indicates that the mayor and council will execute a contract with Write Associates. Though I requested the contract governing this relationship on three separate occasions, I have been advised by City Clerk Debra Heck that no such contract exists. Expanding mid-day hours of the City Clerk's office- It is The Scoop's finding the city has stopped the City Clerk and her assistant from taking lunch at the same time. Closing of the Police Substation- For you math whiz's the savings was .008% of the City Budget. In plain language a $625 per month rental stopped for a city with a $93,000,000 budget, if we want to call that "savings," you belong in the Public Relations field. Let's focus our efforts where they belong and stop the litigation that this new council so eloquently politicized as costing MILLIONS. Establishing a police commission- after reading articles published in The Record I have only seen a list of things Commissioner Sims cannot get involved with, what can he? Was this just a way to push the candidate who had the public support out of the Deputy Mayor role? Considering the building of a new community center- What are we spending hundreds of thousands at the new Cultural Arts Center for?! Hired a Director of Economic Development- well, I think we addressed this above. Community Blood Services of Paramus has recently reported that blood supplies have dwindled to less than a one day's supply. There is a severe blood shortage in North Jersey. Though all types are in need, there is a severe shortage of O positive and O negative blood. 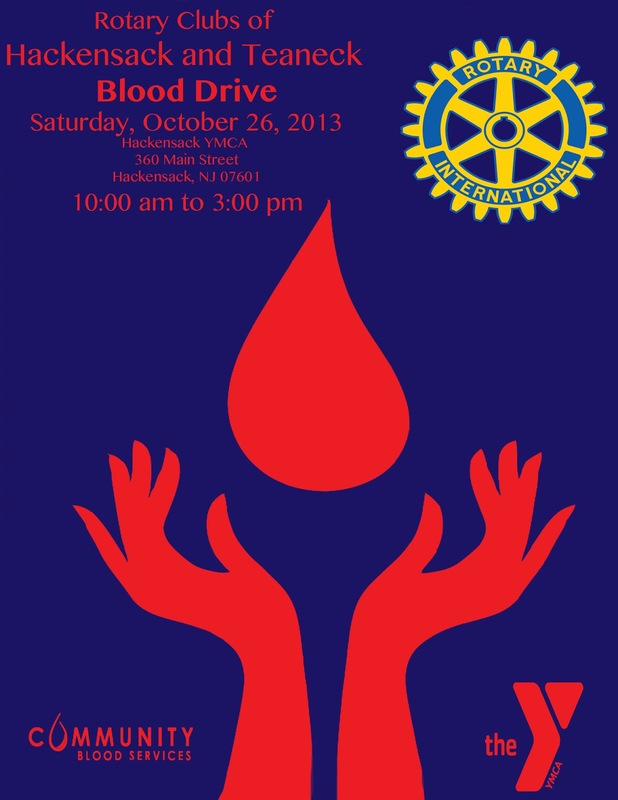 On October 26, 2013 the Hackensack and Teaneck Rotary Clubs will be joining forces to host a blood drive at the Hackensack Y (360 Main Street). The blood drive will take place from 10:00 am to 3:00 pm and is being hosted in conjunction with the Community Blood Services. All are asked to please attend the blood drive and offer a donation as supplies are critically low in the North Jersey area. Bergen Volunteer Medical Initiative received a $25,000 grant award from The Russell Berrie Foundation to expand its Diabetes Education and Patient Care program to reach many more patients at risk for developing diabetes and enable them to receive education and treatment to promote diabetes prevention. In addition to the patients with diabetes currently being treated, this grant will allow BVMI to add additional staff and educational programming to focus on the healthcare needs of more than 340 pre-diabetic patients. "Funding from this grant will permit us to expand our diabetes education services to a significant segment of our patient population to provide much needed education on proper nutrition and exercise, and to help stabilize other key health indicators," stated Dr. Arthur DeSimone, BVMI's Medical Director. "Facilitating the prevention of diabetes in pre-diabetic patients is our ultimate goal." Medical care is currently being provided by volunteer physicians, nurse practitioners and nurses, as well as a staff Certified Diabetes Educator nurse and a registered nutritionist. Since many of the people who seek medical care at BVMI have not received adequate health care in some time, a significant number of those with diabetes and pre-diabetes are first diagnosed by BVMI doctors as part of routine primary care assessments. Through its “culture of caring” and medical home model, BVMI provides comprehensive care and ongoing diabetes education to help people with diabetes and patients at risk lead healthier lives. BVMI provides free primary and preventive medical care for working, for low-income Bergen County residents who have no health insurance or the means to pay for care. The state-licensed Center is located at 241 Moore Street, Hackensack, NJ. BVMI is a 501 (c)(3) non-profit organizations and is completely dependent on contributed income from individuals, businesses, community groups and foundations. For more information, contact BVMI at 201-342-2478 or visit www.bvmi.org. 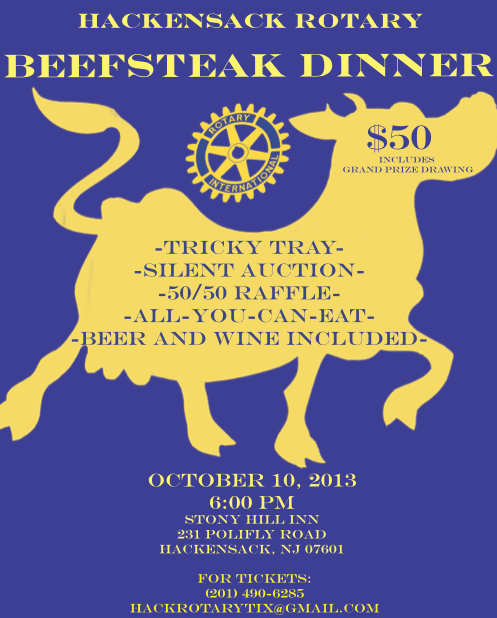 The Hackensack Rotary will be hosting a beefsteak dinner to raise funds on October 10, 2013 at the Stony Hill Inn. Tickets are $50 and include beer, wine, soda, antipasto, salad, all-you-can-eat beefsteak, french fries, and dessert. The ticket price also includes entry to the grand prize drawing. There will be entertainment and the club will also be hosting a 50/50 raffle, tricky tray, and a silent auction. All proceeds from the event will support the Rotary in their offering of scholarships and community service projects. I can't believe that I haven't yet offered a promotion for Boconni located at 363 Essex Street. My family and I are regulars, we generally visit Boconni three to four times a month. I have even used Boconni for catering an eighty person party. The parking is tight, you may have to park on the street. They do have outdoor seating, though it is not advisable. I sat outside once this summer and the constant flow of police cars and ambulances did not make for an enjoyable outdoor experience. Upon arrival Frank, one of the owners, will greet you with a smile and a warm welcome. The atmosphere is casual, that of your friendly neighborhood restaurant. Whether looking for a quick bite after a long day at work, or going out with friends, Bocconi is a great option. The tab won't set you back too far either, a dinner out for two, with an appetizer, can easily be done under $50. Note this restaurant is BYOB. While Frank works the dining room, his partner, Marco, works magic in the kitchen. We started with the "Green Salad" which is a mix of greens and romaine covered in apples, walnuts, and gorgonzola cheese. The salad is covered in a thick balsamic vinaigrette. As a creature of habit, I generally either order the Cavatelli with sausage and broccoli rabe, or the Seafood Risotto in a red sauce. Tonight I had the Seafood Risotto. As you see below, the servings are a generous helping of Risotto, and the sauce has a slight spiciness. The plate is filled with a mix of clams, mussels, shrimp, and tonight as a special lobster--there is no complaint over the generous helpings. The Grey Sole Oreganata is a helping of sole and shrimp lightly breaded and served in a delicious lemon butter sauce, not too thick and not runny. The dish is served with steamed broccoli, carrots, and potato wedges. The Wild Salmon is served with grilled grape tomatoes and a heaping pile of steamed garlic spinach, in the perfect amount of oil. We didn't have dessert on this trip, but the Homemade Tiramisu is a crowd favorite. 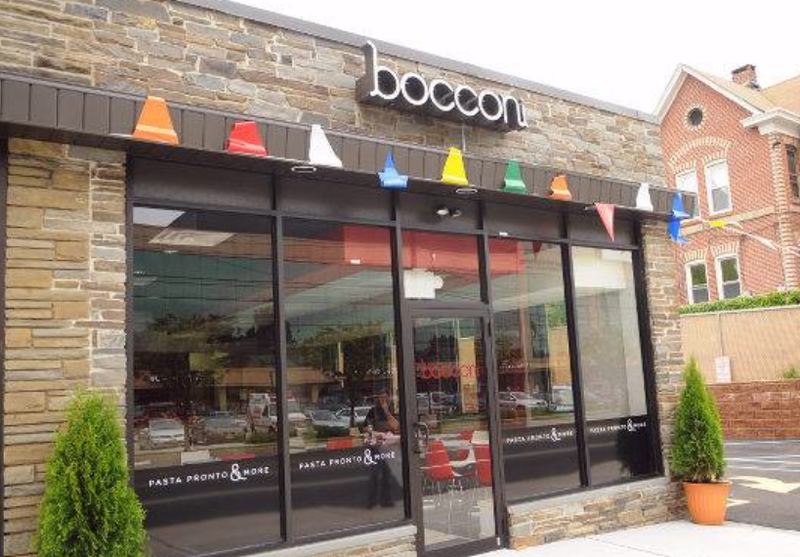 All in all, whether as a go-to quick meal out when you don't feel like cooking, or a weekend destination--Bocconi is a local favorite. And it even got the Nana E two thumbs up!